A team of researchers of the Faculty of Biology and the Biodiversity Research Institute of the University of Barcelona (IRBio), together with the staff of the Natural Park of Montgrí, Medes Islands and Baix Ter, and the Catalan firefighter service removed a fishing net abandoned in the Marine Reserve of the Medes Islands (Girona, Spain) this September. The first localization warning came from an instructor of a diving center in Estartit (Baix Empordà). The net taken from the sea bed is 200 meters long and quite heavy; it was left on a sandy bottom with pebbles and some rocks. The information from the instructor and the level of epibiosis (encrusted organisms) on the net indicate that it was submerged for two years. Before removing it, experts studied it to calculate the impact it could have on the sea beds; they also sought and released caught wildlife. Then they took it from the bottom, avoiding erosion and protecting marine species during the extraction process. Due to the scale and weight of the net, the firefighters had to take it out in two steps with the help of an air balloon. According to the experts, although the erosion effects of the net on the rocks are significant, the trace that remained on the sea bed didn't have any important impact. 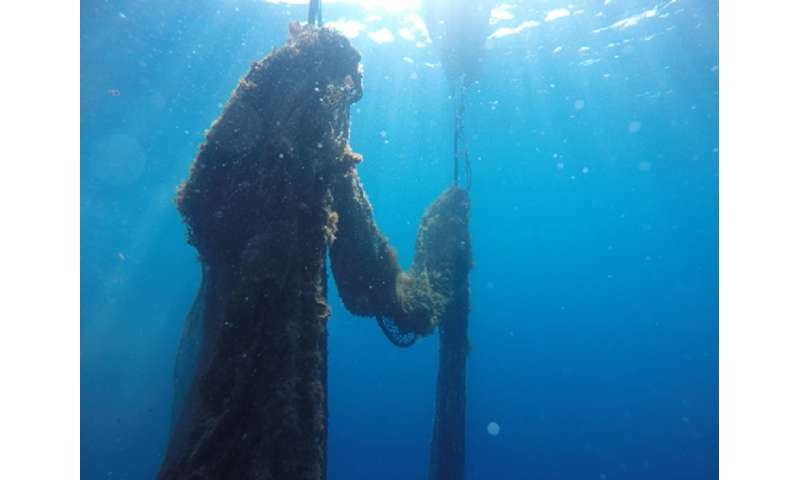 These findings show that there is still illegal bottom trawling in the marine reserve. The results of the park's marine biodiversity monitoring program show a decline of some commercial species such as the gilthead sea bream, thought to be due bottom trawling, which this net proves. This activity is part of the project "Evitem la pesca fantasma," which started in 2015 at the Natural Park of Montgrí, Medes Islands and Baix Ter, to remove nets and fishing gear from sea beds to protect species and benthonic ecosystems from negative impacts.